It’s almost time to return to school for a new year, and I have started the back to school baking. I like to stack the freezer with various snacks and treats ready for lunchboxes, such as muffins, cakes, and slices. 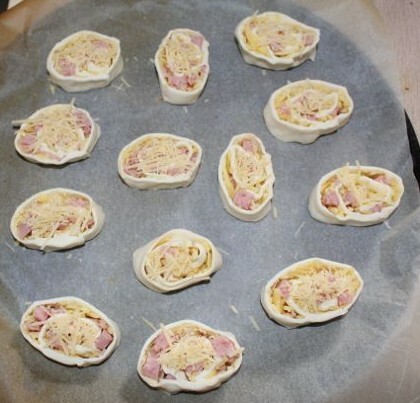 One of my favourites are these easy cheese and bacon pinwheels. 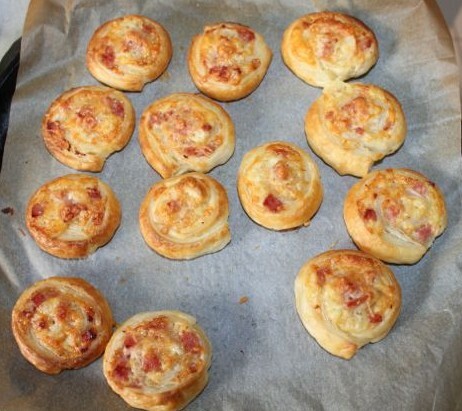 Yummy cheese and bacon pinwheels. More puff pastry, my kids just love puff pastry! 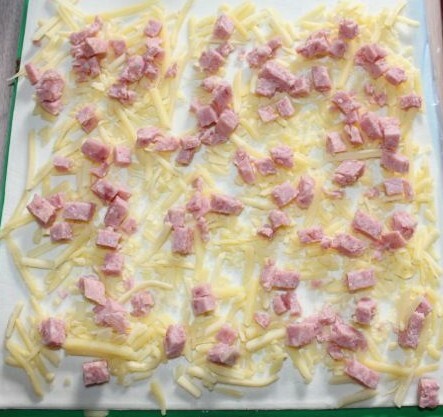 While the puff pastry is defrosting on the table, I gather the rest of the ingredients, which is only grated tasty cheese, diced bacon and I like to add a little grated parmesan to the top of each one before cooking them. Laid out prior to rolling. I spread the grated cheese over the pastry sheet, and then the bacon pieces, trying to give it a fairly even coverage. This is a great job for the kids, though I have to watch that we don’t end up with all the bacon in one corner! Then I roll the pastry from one edge up into a log, catching all the cheese and bacon inside, and pinch the edge down to seal it. The log is then cut into slices around one to two centimetres in width. These slices are placed on their sides on the baking tray (I always use baking paper on the tray for ease), I add the grated parmesan then put them in the oven until they are golden. Rolled up ready for slicing. These are delicious little savoury bites, and they freeze quite well, though the pastry will not be as crispy after defrosting as it would be straight from the oven.